Syracuse, NY. Fayette (or Firefighter's) Park. 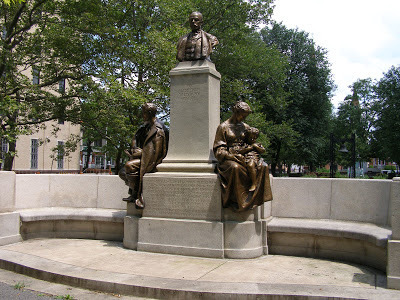 Hamilton S. White Monument, Gail Sherman Corbett, sculptor. Postcard. 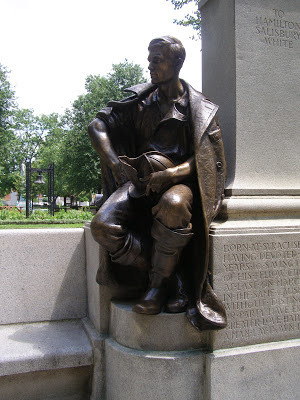 When I started this blog, one of my intentions was to report on the most important, interesting and beautiful (yes, I still use that term occasionally) public monuments in Central New York. A few years ago (!) 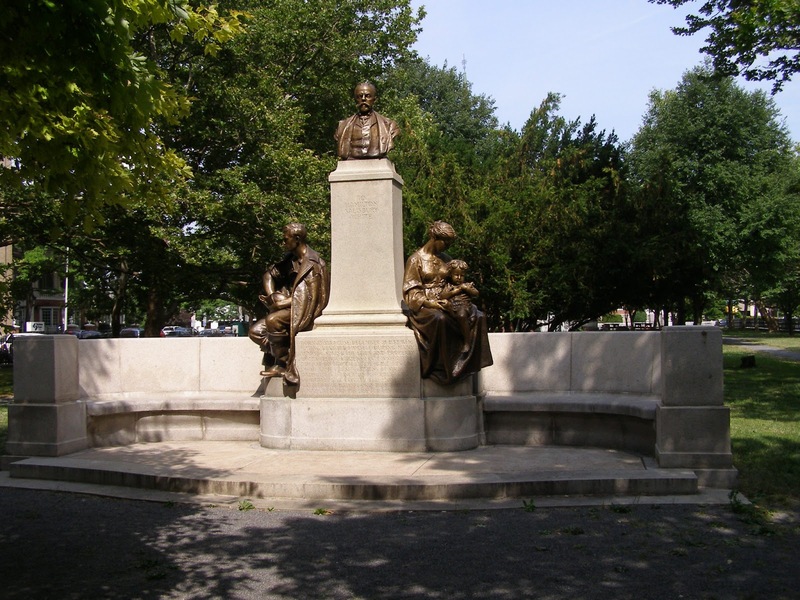 I wrote about the restoration of the Kirkpatrick Monument at Washington Square, and mentioned the earlier monument to Hamilton Salisbury White created by the same artistic team - Gail Sherman and Harvey Wiley Corbett, (who married in 1905) and restored by the same women, Sharon BuMann. The monument is situated on the west side of Fayette Park (now Fayette Firefighters Memorial Park) and provides a well-designed architectural and yet intimate introduction to the park from Downtown. Syracuse, NY. Fayette (or Firefighter's) Park. 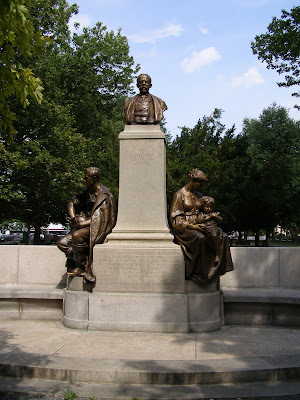 Hamilton S. White Monument, dlt. Gail Sherman Corbett, sculptor.. Photo: Samuel D. Gruber (2008). Because my most recent post was about a turn-of-the-20th century Engine House Number 10, I'd like to now write more about the Hamilton S. White Monument since it received a lot of attention when it was made, and it celebrates one of Syracuse's most colorful characters, and the founder and patron saint of our Fire Department. 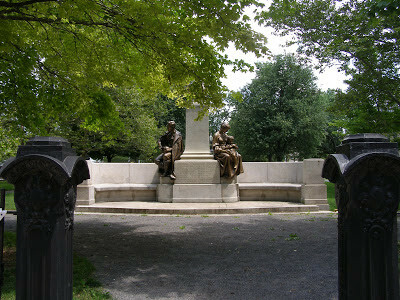 It is also one of the very best monuments and pieces of public art in Central New York. A third reason to write now is that the monument was written about in great detail, probably by Irene Sargent, and published by fellow Syracusan Gustav Stickley in The Craftsman Magazine in 1905. Stickley is now the subject of a new exhibition at the Everson Museum, and efforts are really getting going on restoring his house on Columbus Avenue. Stickley's familiarity with Gail Sherman points out an important fact about Syracuse's art world in the early 1900s; the important role played by women. Women were not just as patrons of the arts, such as Helen Everson, but as artists (such as Gail Corbett and renowned ceramicist Adelaide Alsop Robineau), and writers and teachers such as Sargent, without whom Stickley probably would not have gotten The Craftsman up and running. The Corbetts themselves, when they left Syracuse the same year they completed the White Monument, continued to involve themselves in the education and promotion of women artists. In 1908, Harvey Corbett designed the for Ellen Dunlap Hopkins New York School of Applied Arts for Women a remarkable building (at 30th and Lexington in New York), where he also taught. NOTEWORTHY incident in the advance of civic art in Syracuse, N. Y., was the unveiling, on June 27th, of the bronze and granite monument which has been over six years in the making and is known as the White Memorial. 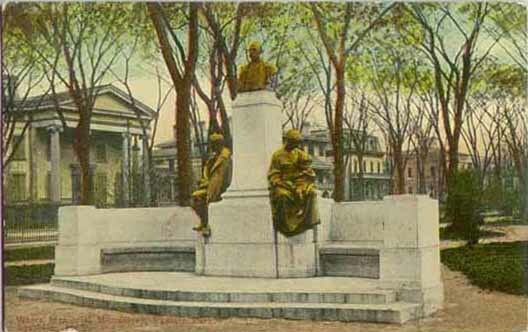 This monument, which is in the form of an exedra, with a central pedestal and bust and symbolic figures in bronze on either side, is the work of a hitherto unknown sculptor, Miss Gail Sherman of Syracuse, a pupil of Augustus St. Gaudens. It is a remarkably virile piece of work for a woman and possesses much merit, especially in the two symbolic figures, which, in the breadth and freedom of treatment and the superb modeling, might well have come from the master hand of St. Gaudens himself. The monument was erected by popular subscription as an evidence of respect to the memory of Hamilton Salisbury White, a wealthy and prominent citizen of Syracuse who took a keen interest in the improvement of the fire department, devoting much time and money to the discovery and utilization of the latest and best methods of fighting fire, and who met his death a little over six years ago while personally helping to extinguish a serious fire that threatened the business part of the city. Therefore, the symbolism of the composition naturally deals with this ruling interest of Mr. White's life. The tall central pedestal upholds a portrait bust of the man himself. This is in bronze, heroic size, and should be the dominant point of the whole structure. As a portrait it is good. The modeling is skillful and the surfaces well-handled, but in strength the bust falls far below the two subsidiary figures, which now center the attention instead of leading it upward to the apex, as should be the case in a pyramidal composition where all the parts are harmoniously correlated. So marked is this defect that the bust seems not only comparatively weak, but detached from the rest of the composition. Neither in line nor in the subtler suggestion of attitude do the two figures below imply a climax of interest above, and the commanding quality is lacking in both the bust itself and the proportions of its supporting pedestal. The two heroic figures in bronze, seated on either side of the central pedestal, are wonderfully poetic in conception and sculptural in execution. They are handled with masterly breadth and simplicity, and with a fine restraint that carries the elimination of unnecessary details almost to the realm of the classic. The figure of the young fireman typifies all the qualities that make for power to combat against overwhelming odds for the protection of life and property. It is that of a man, young, lithe, sinewy, resting for a moment before renewing the battle, which he is watching with alert concentration expressed in every line of the face and of the tense, vigorous form. The poise of the head upon the broad shoulders, the modeling of the bared throat and arm, the strong, vital swing of the whole body, is typical of magnificent manhood in its full strength, every atom of which is put forth to guard peaceful lives and homes against the element that lays waste the work of human hands. The fireman's hat is held lightly on one knee, and the heavy coat, flung loosely about the shoulders, falls in broad, sculptural folds that afford just the right support for the figure. The group of the mother and child, on the other side, is a symbol of the peace and repose of home. The mother, brooding with down- bent head over the child she holds in her lap, typifies all womanhood and motherhood. The lines of figure and drapery are tender and flowing, the pose gracious with the restfulness of a completed life and happiness. The child, a sturdy little fellow who seems about to spring away again to his play, has in his arms a toy fire-engine. The curly head, pushed back against the mother's arm, is a triumph of delicacy and mobility in its modeling, and very subtle is the suggestion of future strength in the baby beauty of the whole rounded little body. The broad, curving seat that sweeps outward on either side of the pedestal is simple and massive in form. The low granite platform upon which it rests is approached by two wide, shallow steps, slightly curved outward. The proportions of this granite base of the monument are admirable, the only blemish being in the short square pillars at the ends, which interrupt the inviting graciousness of the curve and give an effect almost of a rebuff. The square tops, also, have an unfinished look, as if intended to support something that is not there. 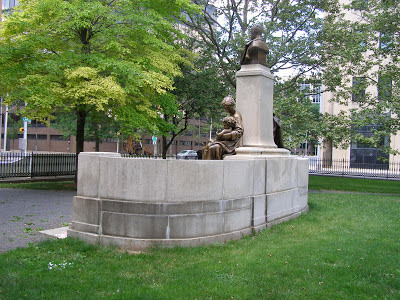 The idea of making the monument in the form of an exedra is a good one, for the subtle suggestion of utility is conveyed by the seat, and its situation in a small, wooded park at the conjunction of three of the busy streets of the city, has the effect of an invitation to the wayfarer to come and rest awhile. ASIDE from the broader acceptation of the symbolism of the two bronze figures, they also typify the life of Mr. White. When a child, his most treasured toys were small fire-engines, and his favorite games were fierce battles with imaginary fires. As he grew older, he went to every fire, driving to the scene in his little basket phaeton, with a fire-extinguisher strapped at the back. After graduating from Cornell University, he returned to his native city, where he resumed his favorite pursuit, going into active service as a volunteer fireman. Possessed of an ample income, he could well afford to indulge his hobby of adding all the latest improvements to the fire-fighting equipment of the city. On New Year's day, 1878, he opened his own fire station, opposite his home, and fitted it up luxuriously, installing the first chemical engine in Syracuse. Just five years later, he made a New Year's gift to the city of the whole establishment, house, engine and all, and at the same time asked to be appointed a hoseman in the department, but was made an Assistant Chief instead. 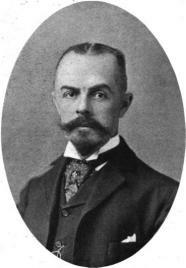 In 1879 he had been made a Fire Commissioner, and he served as such, with the exception of one term, until his death. Officially and unofficially, his connection with the department extended through twenty-eight years, during all of which time he served without salary. When he traveled, either in this country or abroad, it was chiefly with a view to studying the latest and best methods of fighting fires, that he might add them to the home equipment. His interest in the personnel of the department was equally great. He knew every fireman in the city,—knew his name, his work, and all about him, and was a friend to whom any poor fellow "down on his luck" might turn in time of need. The wealth and prominence of family which surrounded his birth and bringing up neither enervated nor made him arrogant, he was absolutely democratic. 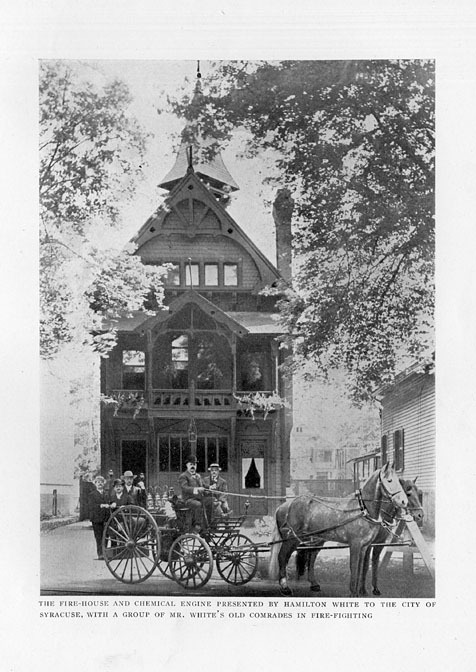 The firehouse and chemical engine presented by Hamilton S. White to the City of Syracuse. From The Craftsman (August 1905). After giving up his fire house and engine, Mr. White arranged his own home so that it afforded almost the facilities of an engine house to an ardent volunteer fireman. In his own room was a set of gongs that sounded a fire alarm at the same instant that the regular signal aroused the fire department. Near his bed stood boots and trousers fastened together in customary fireman style. At the head of the stairs hung his coat, and his helmet was on the newel post at the foot. The front door opened out like the doors of an engine house, and the same electrical apparatus that sounded the gong swung open the door, so that in less than a minute after the first stroke of the alarm, Mr. White, clad from boots to helmet, stood upon the porch, to find awaiting him his horse and trap, harnessed with the lightning rapidity born of long practice and ready for the race. The driver had standing orders to call him from any social function which he might be attending, and at the first sound of the alarm the horse was put at full speed in the direction of the house where Mr. White was to be found. More often than not he met the trap half-way, having rushed out hatless and with a nice disregard of evening clothes in his eagerness .to get to the scene of the conflagration. It was characteristic of the man that he met his death clad in evening clothes under his fireman's helmet and rubber coat. "It is not the gift of any one rich man or of any small number of rich men. It is the offering by hundreds of the people of this city to a man loved by them for those qualities of mind and heart which make for good citizenship. It is the dimes and quarters and half dollars and dollars of the men, women and children in every walk in life who knew Hamilton White, who appreciated his cheerful greeting, the kind words of encouragement and advice which it was his wont to bestow, and it stands and will stand for years to come as a city's tribute to a good man, a man who was the average man's ideal of a good citizen." Syracuse, NY. 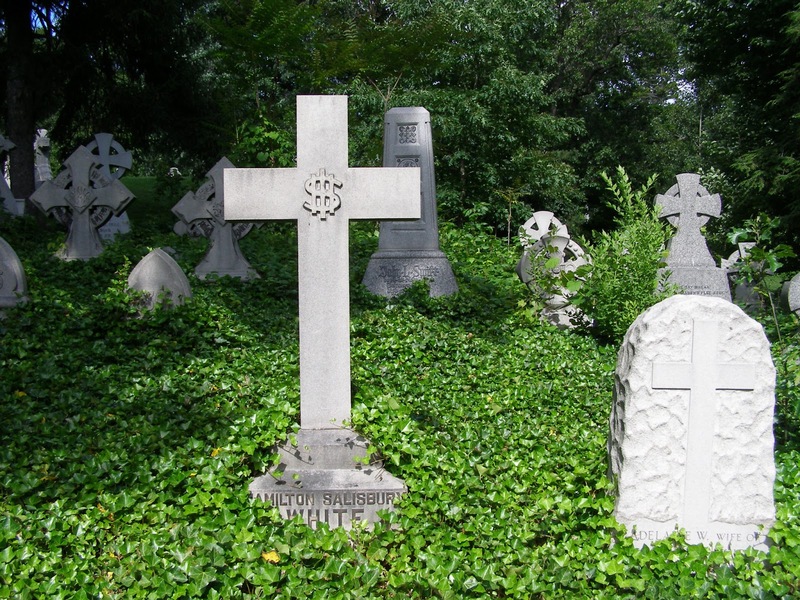 Oakwood Cemetery. Grave of Hamilton Salisbury White. The monogram is of the letters I H S, the name of Jesus, and can also stand for "in hoc signo," from "in hoc signo vnces" (not, as is sometimes recounted, a US dollar sign). Photo: Samuel D. Gruber (2009). Actually there was a lot of controversy as to who should creates the monument. Moses Ezekiel, Franklin Simmons, and Emma Cadwallader-Guild (more often spelled "Cadwalader" and often with the hyphen omitted)were offered as choices in the October 31, 1902, Syracuse Post-Standard.